1. Premises. 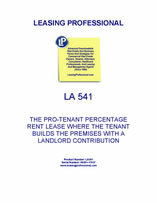 Landlord leases to Tenant and Tenant hires from Landlord the real property situated at __________________ consisting of approximately ________________ square feet of land which property is more particularly des­cribed in Exhibit A hereto, together with all improvements now or hereafter constructed thereon all of which are here­inafter referred to as the “leased premises”. If the leased premises are now or hereafter served by an alley, easement or right of way, Tenant shall have full right of ingress and egress in common with others, over such alley, easement, or right of way. 2. Term. Tenant shall have and hold the leased premises for a term of ________ ( ___) years and ________________________ months commencing on the _____ day of _______________ and expiring on the ____ day of _____________. In the event the leased premises are ready for occupancy by Tenant before the commencement date of this lease, Tenant may, at its option, occupy the leased premises prior to such commence­ment date. Such prior occupancy shall be under all of the cov­enants, conditions and agreements of this lease, except such prior occupancy shall not require the payment of any rental. (a) Minimum Rent. Tenant agrees to pay to the place designated in the paragraph entitled or at such other place designated by Landlord in the provision below pertaining to "Notices", without prior demand therefor as minimum rent, the sum of ________ Dollars ($ _________) per annum payable in monthly installments of ______________ Dollars ($ _________) each in advance on the first day of the month. The minimum monthly rent shall be prorated on a per diem basis with respect to any fractional calendar month. Subject to the provisions of the paragraph entitled “Force Majeure,” the minimum rent shall commence on the first (1st) day of the month of the term hereof, or on the day Tenant is open for business at the leased premises, whichever first occurs. (iii) Records of Sales. Tenant shall keep at the leased premises or at Tenant’s principal place of business, full and accurate books of account, records and other pertinent data (including all supporting records such as original sales slips and checks, reports on excise and selling taxes and cash register tapes) of the gross sales relating to the leased premises (including the gross sales of any subtenant, licensee or concessionaire). Tenant shall, upon Landlord's request, furnish a copy, certified as true, of the sales tax reports, insofar as such reports pertain to the leased premises, filed by Tenant with the governmental authority charged with the collection of the sales or other tax covering any period of time for which Tenant has furnished a statement of gross sales to Landlord. Such books and records shall provide records of each day’s sales so that a day-by-day record is maintained, and shall be retained for a period of four years after the close of each calendar year. The acceptance by Landlord of any statement or any payment of percentage rent for any period shall not bind Landlord as to the correctness of the statement or the payment. At any time within two years after the receipt of any such statement, Landlord shall be entitled to conduct an audit of such gross sales either by Landlord or by a certified public accountant designated by Landlord. Such audit shall be limited to the determination of gross sales and shall be conducted during normal business hours. If such audit shall reveal a deficiency in the payment of percentage rent, Tenant shall immediately pay such deficiency with interest at the rate of ten percent (10%) per annum from the date when such deficiency should have been paid. In addition, if any of Tenant’s annual statements of gross sales shall be found to have understated gross sales by two percent (2%) or more, then Tenant shall pay all of Landlord’s costs and expenses connected with such audit. In the event that Tenant fails to submit any annual statement of gross sales when due, Landlord may so notify Tenant; if Tenant does not submit such statement within ten (10) days after delivery by Landlord of such notice, then Landlord may make an audit of Tenant’s books and records relating to the gross sales for the preceding year. Such audit shall be commenced within ninety (90) days after the date by which such statement should have been submitted. Any such audit shall be final and binding upon both parties. In the case of any audit made by Landlord as a result of Tenant’ s failure to submit an annual certified statement of gross sales when due, Tenant, within five (5) days after demand by Landlord, shall pay to Landlord the additional percentage rent that may be due, computed in accordance with the provisions of this Lease upon the basis of such audit, together with the expense of such audit. Any information gained from Tenant’s quarterly and annual statements or from an audit shall be confidential and shall not be disclosed other than to carry out the purposes hereof; provided, however, Landlord shall be permitted to divulge the contents of any such statements or audit in connection with any financing arrangements or assignments of Landlord’s interest in the leased premises or in connection with any administrative or judicial proceedings in which Landlord is required to divulge such information. All sales originating at, in or from the leased premises, whether for cash or on credit, shall be considered as made and completed therein, even though bookkeeping and payment of the account may be made at another place and even though the actual delivery of merchandise or performance of a service may be made f ran or at a place other than the leased premises. 4. Utilities. Landlord, at its expense, shall have all utility lines, including but not limited to, electricity, gas, water and sewer, brought to a point within the leased premises. Tenant agrees to pay all charges for electricity, gas, water, sewer, refuse, telephone and other utility services used by Tenant on the leased premises during the term of this lease or any renewals or extensions thereof. 5. Use. The leased premises shall be used for retail sales and for no other purpose without the prior written consent of Landlord. 6. Compliance With Laws. Tenant shall not do or permit any­thing to be done in or about the leased premises, nor bring nor keep anything therein which will in any way cause the premises, to be uninsurable with respect to the insurance required by this lease, or which shall constitute a nuisance. Tenant shall comply with all requirements of all governmental authorities now in force or which may hereafter be in force pertaining to the use of the premises by Tenant provided, however, that Landlord at its cost and expense and not Tenant shall make structural alterations or additions required to be made to the premises. (a) Tenant agrees to construct at the location shown on Exhibit A hereto a one-story building, the ground floor of which shall consist of approximately ________________________ square feet. Tenant shall, after receipt of a fully executed copy of this lease, proceed promptly to prepare preliminary plans and specifications for the construc­tion of such building, such construction to be done in accord­ance with all applicable ordinances, laws and governmental rules and regulations. Such preliminary plans and speci­fications shall be submitted to Landlord for written approval. Any objections by Landlord and the reasons therefor and corrections thereto shall be in writing delivered to Tenant within fifteen (15) days after receipt thereof by Landlord and promptly upon receipt thereof, Tenant shall prepare final plans and specifications which shall likewise be sub­mitted to Landlord for approval. If Landlord has any ob­jections to such final plans and specifications, Landlord shall specify such objections and corrections thereto in writing, shall amend such final plans and specifications to conform with such objections of Landlord and shall, with­in ten (10) days after receipt thereof by Landlord, send such amended plans and specifications to Tenant for approval. Both parties shall initial such final plans and specifica­tions. Upon approval as herein contemplated of such final plans and specifications, Tenant shall proceed diligently to commence the construction of the building and to complete such construction in accordance with such final plans and specifications.